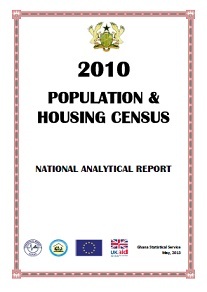 The 2010 Population and Housing Census (PHC) is the eleventh overall and the fifth post-independence national census. The first census in the country, conducted in 1891, was under the auspices of the then British Administration. Censuses were then carried out every ten years thereafter in 1901, 1911, 1921 and 1931 when the Second World War disrupted the series, hence there was no census in 1941 (Bureau of Statistics, 1964; Engmann, 1985). After the war, a census was conducted in 1948, and that was the last to be organized by the then British Administration. The earlier censuses were conducted in the same years as censuses in the United Kingdom (Bureau of Statistics, 1964).